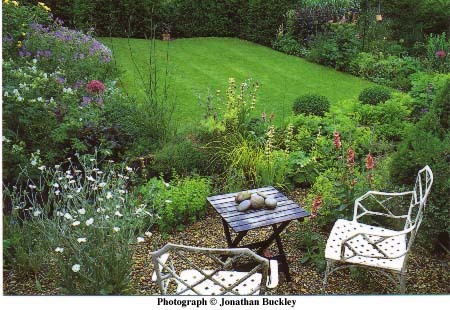 Since 1992 we have been creating our own garden on top of a windy Wiltshire chalk hillside. Fovant Hut, an old coaching inn on an ancient byway, is set in a designated 'Area of Outstanding Natural Beauty' . The one-acre site includes a Sheltered Flower Garden with planted gravel areas, a Hot Walk, a Shade Garden, a Breakfast Corner, a Potager, a Pergola and a Wild Flower Patch. The Garden Room contains exotic plantings spilling out onto the Deck which stretches across a long basin of water and looks out to an impressive stand of mature ash trees underplanted with native shrubs. Carefully placed benches exploit the stunning downland views and are positioned so as always to be able to find a cosy corner to relax and enjoy the garden. The garden has been featured in several glossy magazines and books and is in The Good Gardens Guide. We enjoy talking to visitors about the design features, plantings and techniques used throughout our garden. The garden will not be open during 2008.